Eddiwarth steeled his shoulder and threw himself at the door. It banged loudly and he bounced off of it like coins tossed against a wall. “Ow! That hurt!” They heard muffled cursing and children’s shrieks. 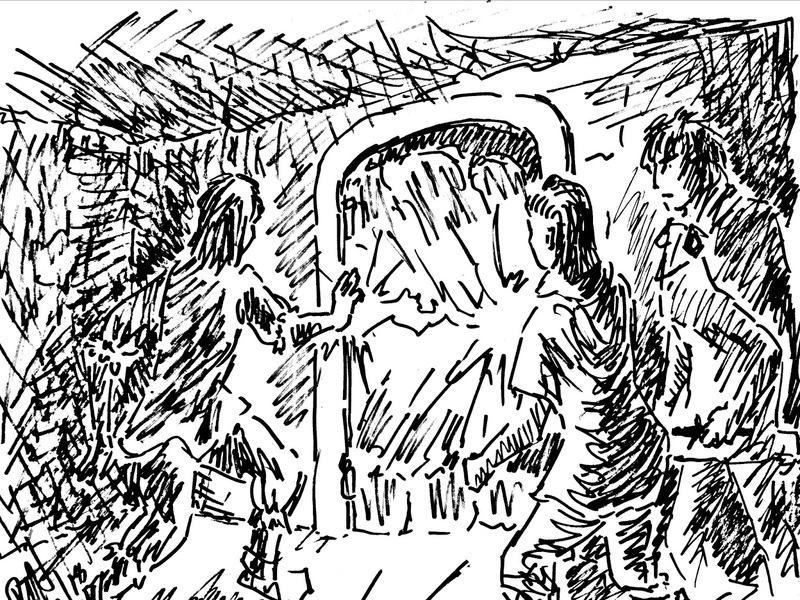 He took a breath and pointed his hand at the door. With a loud crackle, bright lines of flashing electricity sparked between his fingers and the handle, shattering it into bits of metal and a thousand shards of wood. What remained spun inwards into the room. Instantly Karendle and DeFrantis ran into the darkness. Eddiwarth could hear them as they stumbled, but the shroud of darkness hid everything. Karendle shouted, grunted, then he heard a crash. That would be the table, I’d bet. He heard a sword rapidly being drawn. Just as suddenly, the shroud of darkness dissipated into the shadows of the room, and he could suddenly see in the lanternlight. The table was upturned, and Karendle was struggling with one of the men. She was behind him, her arm around him in a choke hold. The other man stood by the downed table, swinging his sword in confusion. Just as Eddiwarth was about to react, he saw something flash in DeFrantis’ hand. The dagger! She ducked low, underneath the man’s flailing arm, and lunged upward, plunging the blade deep into the man’s chest. He gasped twice, then stumbled backward. She hissed, “Stay away from my kids!” and pushed him down. He didn’t get up. Eddiwarth was stunned and unsure what to say or do. The entire fight had just flashed past him like leaves in the wind. The crying children brought his attention to focus again. The oldest girl shrugged. “We don’t know. Someone took them away a few days ago!” DeFrantis dropped her head and reached around again to hold these five children close. Eddiwarth and Karendle looked on at the scene before them. They glanced at each other, and that glance carried a loneliness, a sense of distance from their own parents. 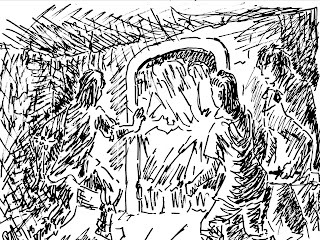 A distant door slam and shouts shattered their reverie.